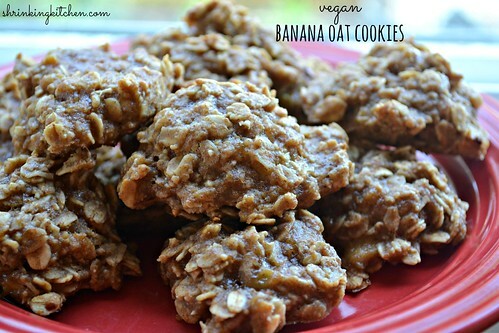 These vegan banana oat cookies might be the easiest cookies ever. Minimal, real food ingredients. Quick prep time. And they’re delicious. And vegan. They could even be gluten free if you omit the wheat germ! I’ve seen a few recipes on Pinterest using a similar concept – no wheat, no eggs, no oats. Basically, the banana is the binder. However, I decided my cookies needed the oats because I wanted them chewy and breakfasty. No, breakfasty is not a word, but I like it…breakfasty. These are a great pre or post workout snack or, like I mentioned above, you could totally have one (or two) for breakfast. They’re full of healthy fats, carbs and just enough protein to keep you feeling full and your energy levels up! You could easily sub a different nut butter – just make sure it’s natural and not full of sugar. Nuts, maybe a little oil, maybe a wee teensy bit of salt. The end. And finally, let these babies cool a bit before you eat them. They’ll hold together better if allowed to cool. Mash up the bananas in a bowl. Add the honey and almond butter and mix well. Finally, stir in the oats and wheat germ. Drop the batter onto the paper by the tablespoonful (I used a 1 tablespoon scoop). Bake for 15-16 minutes, remove and allow to cool. Just as an FYI, honey isn’t vegan. These sound good, though. Going to try them and sub maple syrup. Thanks for the recipe. I’m going to make them now….but FYI – waxed paper shouldn’t go in the oven.